Matthias Schweighöfer already was a popular German film star when he teamed with Amazon to write, direct, produce and star in the service’s first German in-house production. Season 1 of You Are Wanted became one of the five most watched series on Amazon Prime Video in 70 countries—a good reason to bring it back for another season. Although Schweighöfer didn’t help write the second season, he did produce and direct. He also stars as hotel manager and family man Lukas Franke, who survived having his identity stolen and his life turned upside down by a sadistic hacker in Season 1. Lukas and his wife, Hanna—spoiler alert—obtained a laptop housing the giant data collection program called Burning Man. If they kept it hidden, no one else would have to go through what they did. But things aren’t all that rosey as Season 2 begins. Henchmen kidnap and drug Lukas, hoping to grab the Burning Man laptop. When Lukas wakes up in a psychiatric hospital, he can’t remember what happened to him. Once again suspected of being a terrorist, Lukas races against secret service agencies, international criminals and hackers to find Burning Man before someone turns is into the world’s most powerful cyber weapon. Schweighöfer said Season 2 explores people’s powerlessness in the face of big entities like the government or corporations. Amazon brought Schweighöfer and some of the other stars to Los Angeles earlier this month for a premiere of the new season. I spoke on the phone with the 37-year-old the day after the premiere. 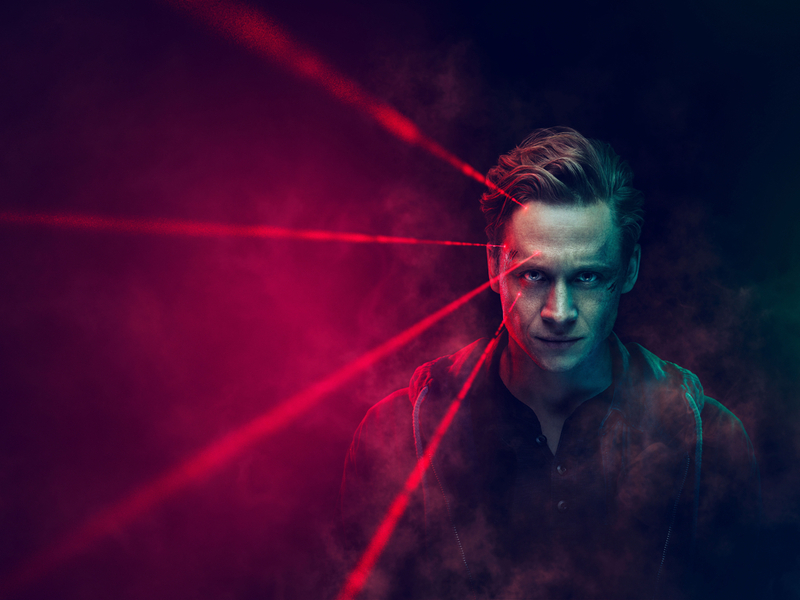 We talked about Lukas’s latest troubles, how “You Are Wanted” has changed the actor’s use of technology, what the show’s success means for German TV and why Schweighöfer decided to pursue a side job as a singer. Season 2 of “You Are Wanted” currently is streaming on Amazon Prime. Have you recovered from your big L.A. premiere? Having press day after another press day is a lot of work, but it’s cool. It’s fun. And it’s wonderful to talk about the show in Los Angeles. It is really exciting to see how Americans feel about the show. For me, it’s beautiful. I’m really happy. What got you interested in the story in the first place? I was interested in the story because it had to do with an average Joe. But not really with an average Joe, but had elements from a normal life we all live. So it’s so close to that and so personal. I knew that people would think about how close their lives are to the [Franke family’s]. And how this hacking is possible. It’s weird, crazy. So you think about maybe there’s someone behind your camera or [hacking into] your phone or your iPad. Everything is possible online. Any of us could become a victim. That definitely makes it even more scary than if this were about a company being hacked. It’s good. It plays with the idea that it can happen to everyone. It can happen to you! I love that. In the first season, his identity was hacked. What’s in store this season? This season is about the fallout from his decision to keep Burning Man. You have to pay for your decisions. … The whole season asks if Lukas’s decision was wrong or right. And it’s about his powerlessness. A lot of people in the world feel powerless against big systems or even against technology. Season 2 is about protecting his family. With the experience of Season 1 behind him, how is he equipped in Season 2 for the new threats that he faces? His memory is gone and the only thing he’s equipped with is his courage to take his life in his own hands and fight back—against what’s happened in the past and what’s happening around him now. Lukas and Hanna wisely take out their SIM cards so they can talk without fear of electronic eavesdropping. Still, their conversation gets picked up through someone else’s phone. And the car is hacked. Could those things really happen? Oh yeah. Everything you see in the show is researched and we discuss those possibilities with real hackers. We work with hackers. … It’s horrible what’s possible, really. It’s so easy to hack a car’s online system. It’s the same even when you want to hack a watch that is connected to your phone. You can hack a [smart] watch and can cause pulses to your body systems. A hacker can change the heart rate because of that. I recently read that robotic vacuums can be hacked in order to map the apartment layout. It’s crazy. Has any of this made you change your online behavior or how you deal with technology? Who’s the bigger threat? Hackers or governments who take citizens information? Or do you not want to comment on that? It’s just hard to answer. What would you say? Hackers? I would say governments. They are lot more powerful and often not so trustworthy. Corrupt governments or agents of governments make me more nervous. Yeah, governments. Hackers, in a way, are cool. But government suits? It was weird to shoot there because it was really big and so empty. It was a huge complex. It gave our show a little historical glimpse of the old times. I love that. It kind of foreshadowed this season because this season is even more about personal spying. And also, the American agent comes after Lukas. Yeah, he’s a guy from Cyber Command. We had to improvise a little because we had to build a headquarters for him in America. It looks cool, but I don’t know what you Americans would say about it. You acted, directed and produced this season, dropping writing. Do you need a break? Yes, I’m tired. I’m planning to take a break. But it was great experience. You’ve worn a couple hats on your movies, but doing six episodes all at once is a bigger commitment. The hardest thing was to act in it, because we had sometimes two or three sets filming at the same time. I had to call the other sets via FaceTime or with walkie-talkies just to make sure that all my actors on the other sets were playing scenes the way I wanted. At the same time, I have to play in scenes on my set. That was the hardest part. Your show, “Babylon Berlin” and “Dark” really have spread German TV around the world this past year. Has that success affected the industry there that you’ve noticed? Ours was the first German show on Amazon Prime; “Dark” is the same for Netflix as we are for Amazon. “You Are Wanted” was the biggest hit on Amazon in Germany last year and did well abroad. These two and “Babylon Berlin” all are good examples of how our German television [shows] can cross borders. Do you see Germans creating more shows now with the idea of an international audience? I think there will be a big run now. But the ideas have to be great. The good thing is that everything is possible now, and we can do it. The recent success demonstrates we [Germans] have cool ideas and we can do original things that work well all over. I think that’s wonderful. You have your own production company, Pantaleon Films. Will you be producing more content for TV? Oh yeah, but first I’m shooting a movie with Jesse Eisenberg in the fall called “Resistance.” Pantaleon is developing it. I play Klaus Barbie in that. Oh, is it fun to get into that evil skin? His history is so weird. He was an evil man and it’s crazy what a government will do to protect a guy like him. But it’s good to play a role like this to show people what a government can do. I did a movie with a director named Thomas Vinterberg. It’s called “Kursk” and stars Matthias Schoenaerts and Colin Firth. It was cool. I hear you also recorded a music album. Will you do more music, too? We’re going to write a second album and do some cool concerts. I’m happy for that. I love the band. It’s great fun. What made you pursue music? I’ve always worked with musicians on the music for my films. We thought, why not try to make our own album? Also, I find it immensely fun to be standing on a stage and making music. I love the immediate proximity to the audience in a concert. With the music I’m more myself. Will we ever see you in a musical movie or stage production? [Laughs.] Never. Never ever in my whole life. Never say never, but no, I’m not a musical guy. [Sings.] “Don’t cry for me Argentina”—no, no, no, I will not do it. According to Matthias Schweighöfer, Season 2 brings in even more powerful female characters to join Hanna Franke, played by Alexandra Maria Lara.